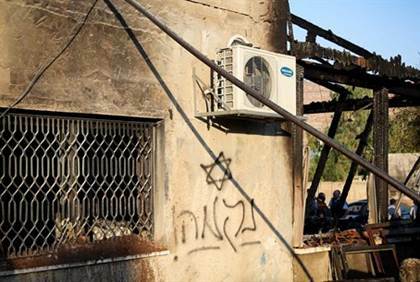 The strong response of the Israeli public and leaders to the arson attack is, truthfully, somewhat comforting. The wall-to-wall Israeli condemnation of this crime has left me and other Palestinians not only ashamed, but also embarrassed -- because this is not how we Palestinians have been reacting to terror attacks against Jews -- even the despicable murder of Jewish children. Our response has, in fact, brought feelings of disgrace and dishonor. While the Israeli prime minister, president and other officials were quick strongly to condemn the murder of Dawabsha, our leaders rarely denounce terror attacks against Jews. And when a Palestinian leader such as Mahmoud Abbas does issue a condemnation, it is often vague and equivocal. Take, for example, what happened after last year's kidnapping and murder of three Israeli teenagers by Palestinians in the West Bank. It not only took President Abbas four days to issue a statement condemning the terror attack, but even then, the condemnation was at best a tentative: "The Palestinian presidency... condemns the series of events that happened last week, beginning with the kidnapping of three Israeli youths." Abbas then went on to denounce Israel for arresting dozens of Hamas members after the abduction and murder of the three youths. Later in 2014, when Abbas did condemn a Palestinian terror attack that killed five Israelis in a Jerusalem synagogue, Fatah official Najat Abu Baker, a few days later, explained that Abbas's condemnation was made "within a diplomatic context... [he] is forced to speak this way to the world." Abbas's condemnation of the attack at the synagogue in Jerusalem's Har Nof neighborhood apparently came only under pressure from U.S. Secretary of State John Kerry, who telephoned the Palestinian leader twice to demand that he speak out against the killings. Abbas's statement said that the Palestinian leadership condemns the "killing of worshippers in a synagogue and all acts of violence, regardless of their source." His statement then also called for an end to "incursions and provocations by settlers against the Aqsa Mosque." Abbas's ambiguous, half-hearted condemnations of attacks by Palestinians against Israelis are only intended for public consumption and are primarily aimed at appeasing Western donors, so that they will continue channeling funds to the Palestinian Authority (PA). In addition, his condemnations almost always seek to blame Israel for the Palestinian terror attacks -- presumably an attempt to justify the killing of Jews at the hands of Palestinian terrorists. In contrast, Israeli leaders who condemned the murder of the Palestinian toddler sound firm and unambiguous. Here is what Prime Minister Netanyahu said after visiting the murdered baby's parents and brother, who were wounded in the arson attack and are receiving medical treatment in Israeli hospitals: "When you stand next to the bed of this small child, and his infant brother has been so brutally murdered, we are shocked, we are outraged. We condemn this. There is zero tolerance for terrorism wherever it comes from, whatever side of the fence it comes from." Netanyahu's strong and clear condemnation left me and other Palestinians wondering when was the last time we heard similar statements from our leaders. I cannot remember ever hearing Abbas or any other Palestinian leader express shock and outrage over the killing of a Jew in a Palestinian terror attack. Nor can I remember the last time we heard of a Palestinian official visiting the Israeli victims of a Palestinian terror attack.